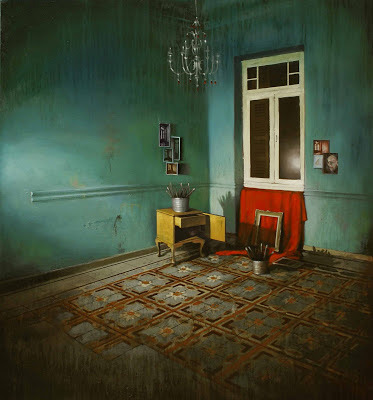 Today we're looking at the work of the artist Tasos Chonias. This is the most traditional artist I've featured on this blog yet. His pieces throw you back into a world of masters of oil, featuring scenes created with deep rich colors and texture that you want to just reach out and touch. You are quickly jarred back into the modern world when you start to realize the subjects on these paintings are not the classic room you expected. His paintings feature aged homes with sparsely decorated corners, often looking like they might have been a studio at one point. Canvases and brushes lie scattered about, and the worn in furniture looks like a collection of whatever happened to be lying around, giving the room an abandoned feel. Arranged in ways that easily lead your eyes around the piece, every detail is composed to take you back to that corner.